The protracted issue regarding how Anaheim councilmembers are elected has come to an end but with a steep price. 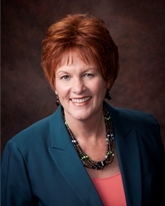 Councilmembers Kris Murray and Gail Eastman has cost the taxpayers of Anaheim at a tune of $2 Million. The City of Anaheim has already racked up $1.2 Million to defend itself and now must bear the cost of paying the litigants legal bills of over $1 Million, the ACLU and Anaheim Community Activists, who brought the issue to it’s head two years ago. The two councilmembers joined with then-Councilman Harry Sidhu in 2012 as council majority stubbornly rejected Mayor Tait’s proposal. The issue centers around Latino activists who echoed the need to change how councilmembers are elected from at-large to districts, because no Latino currently sits on the dais and 52% of the community are Latinos. The settlement was agreed upon from a case Moreno, et al. vs. City of Anaheim that was slated to go to trail on March 17, 2014 regarding the California Voting Rights Act (CVRA). Frankly, Mr. Cunningham forgets that Councilmembers Murray and Eastman have an fiduciary duty to protect the city’s assets such as taxpayer funds and settle the issue back in 2012 as suggested by Mayor Tait to let the voters decide how their councilmembers are elected. Councilmembers Murray and Eastman should realize that the buck stops with them and they have the power by finding a consensus with Mayor Tait instead of fighting against him and the community. The bottom line is this: consensus is cheap, litigation is expensive. We are looking for donors to help us fund this project for every City, School District, and Special District in Orange County. Please send an e-mail to info@custom-campaigns.com if you want to help sponsor this project. 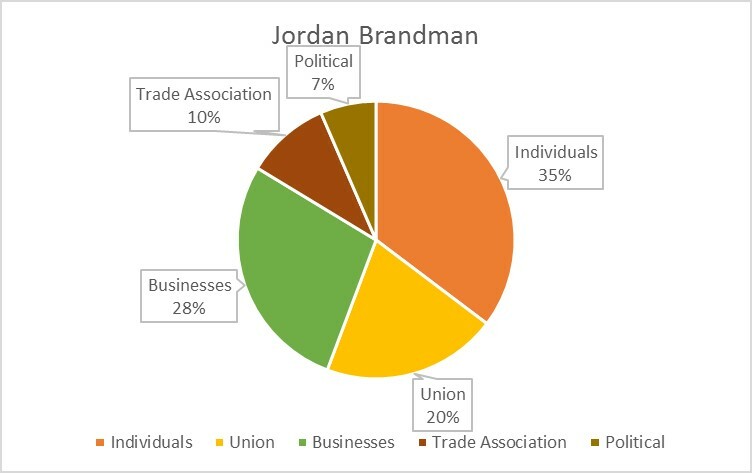 If you click the link to read more, you can find out who each individual donor was to each campaign broken down by category. In an op-ed to bolster his endorsed candidates, Anaheim Mayor Tom Tait irresponsibly compares investment in Anaheim’s resort district to the failed Solyndra solar power deal and says that such investment amounts to “sweetheart deals” and pandering to “special interests.” Does it really need to be said again that forward looking economic investment is is what makes Anaheim unique among cities. Or that our city’s 60-year, mutually beneficial partnership with Orange County’s largest employer is not a special interest? The truth is that public-private partnerships with the resort district have allowed Anaheim to balance the budget with cash reserves at a time when other cities are bankrupt. Investment in parks, libraries and gang reduction programs are being made at a time when other cities are contracting out basic services they can no longer afford to provide. Mayor Tait’s claim that the Garden Walk economic assistance program is a $158 million give-away is false. In fact, the city’s data is very clear that the action taken by the council earlier this year to amend a long-standing program for $40 million in additional tax reduction was designed to secure a $300 million, four-star hotel development. The Garden Walk hotels will actually raise $187 million over 20 years in new revenue to the city’s general fund – funding that will support police, fire, parks, libraries without raising taxes on our residents or businesses. I encourage Anaheim residents to learn more about the city’s long-standing economic assistance programs on the city’s web page at http://www.anaheim.net/articlenew2222.asp?id=1520. It’s been said that the OC Register is staunchly Libertarian, supposedly pro-business and supportive of sound fiscal policies, but their attacks on the resorts and on council policy are now becoming a pattern. When I attempted to rebut anti-business language in another recent editorial, I was given 250 words buried a week later under the day’s letters. The placement of a nearly full page op-ed, the day before the election, is clearly an orchestrated effort by the Register’s editorial staff to take aim at Anaheim’s business community – and completes an unprecedented campaign by the Register to impact the outcome of Anaheim’s elections for the mayor’s endorsed candidates. In his op-ed, Mayor Tait claims to be a “free market guy.” Why then are the business community, the resort district, the Anaheim Chamber, OC Tax, Orange County Business Council, community leaders, and many more, endorsing the two opponents facing Mayor Tait’s candidates? Why is the mayor endorsing a candidate who is a vocal supporter of gate taxes at Disneyland, Honda Center and Angels Stadium? I think it’s time that balanced reporting is done on the impacts of Anaheim’s stadium and resort districts – not just in our city, but countywide. In Anaheim, we’re focusing on improving our community, torn apart not by special interests but by those who support change ushered in with violence and hatred. Politicians who support these anti-Anaheim voices aren’t pragmatic and independent. They’re desperate. 151,311 voters live in the City of Anaheim: 10,196 voters live in Ed Royce’s 39th Congressional District, 27,431 live in John Campbell’s 45th Congressional District, and 113,684 live in Loretta Sanchez’s 46th Congressional District. You’ve seen Emami’s endless mail count on the Anaheim City Council race, but he has the good fortune to be one of the 27,431 Anaheim voters in CD-45. This is a tale of the mailboxes for the 10,196 Anaheim voters in CD-39. Before I get into the mail, I should note there are precinct walkers and phone bankers from both camps scurrying and calling across CD-39. An OC Political friend passed on a transcript he made of a phone call he received from the Jay Chen campaign in October. The content of this script is clearly geared toward Republicans, and the OC Political friend who transcribed this call is a high-propensity Republican in a pure Republican household. Hi. Good afternoon. 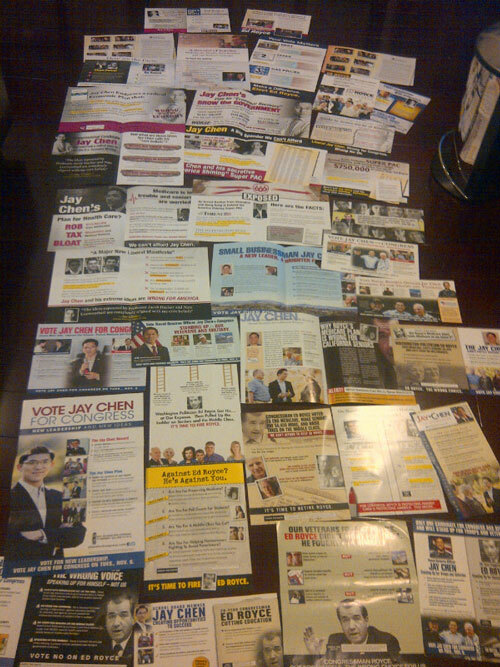 My name is Andrew and I am a volunteer with the Jay Chen for Congress Campaign. I’m calling you today to tell you a little bit about Jay and about his campaign for congress in your district. Jay is a small businessman, a school board member and US Naval Reserves intelligence officer who is running to represent you in Congress. Unlike his opponent, Ed Royce, Jay volunteered to serve our country and he will protect our veterans when they come home. Jay was recruited right out of Harvard University to work for Bain and Company, a section of the successful Bain Capital, and he has valuable experience balancing the books and improving results without raising taxes. Jay is clearly the right person to serve this district in Washington. For more information about Jay or our campaign, please visit our website at chenforcongress.com. And since you are registered to vote by mail your ballots will be arriving around October 8th. Please remember to vote and sent them back in. Thank you for very much your time and I hope you vote for Jay in the upcoming November election. In 2002 Jay joined Bain & Company, a global business consulting firm. While at Bain he worked closely with top executives of Fortune 500 companies to develop and implement crucial business strategies. He managed the roll-out and evaluation of new products for a global logistics company and analyzed the cost-savings for a mergers and acquisition in the technology space with a combined value of over $1 billion. Jay believes his financial and business experience will be of great value to the school board, which manages an operating budget of over $360 million dollars and nearly 3000 employees. Anyone else find it fun that Democrat Jay Chen is touting his Bain experience while Republican Mitt Romney is getting trashed for his Bain experienced by national Democrats? Now, on to the money: From July 1 to October 17, Royce spent $1,232,479 while Chen spent $406,351. However, Super PAC America Shining (run by Chen’s brother) has spent $762,316, with $65,894 supporting Chen and $696,162 against Royce. 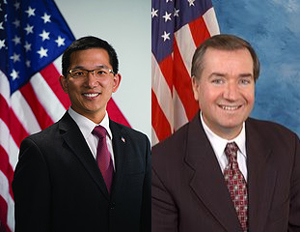 In other words, between America Shining and Jay Chen, the pro-Chen/anti-Royce spending since July 1 has reached $1,458,478 while Ed Royce has spent $1,232,479. For both candidates, over 60% of their direct contributions came from individual citizens. 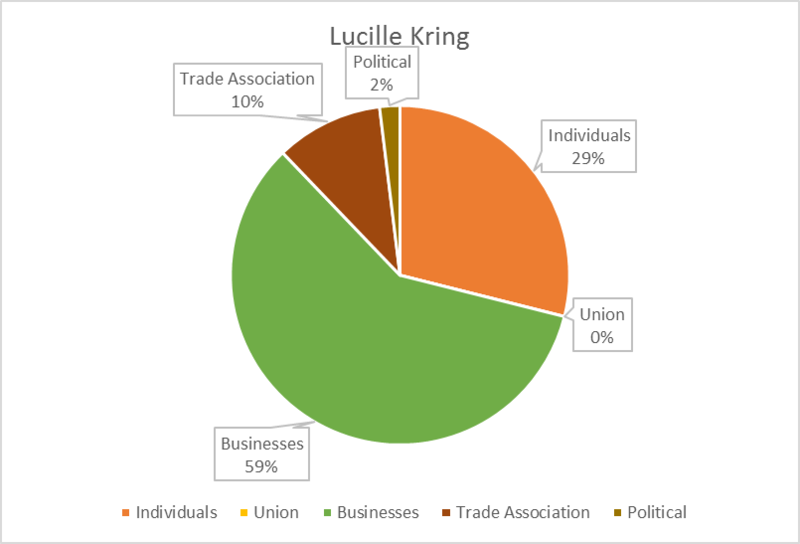 However, if you account for America Shining, the pro-Chen/anti-Royce money received has been 52% from PACs, and 33% from individual citizens, while pro-Royce/anti-Chen money that’s been received is 62% from individual citizens and 36% from PACs. He’s received 36 mailers, and there’s still three more mailing days before Election Day (today, tomorrow, and Monday). I “only” received 15 mailers, and my Republican mother “only” received 8 mailers. Inexplicably, my independent sister only got 1 mailer (it was pro-Royce). Stacked on top of each other, they are 1/2 inch thick. They weigh a combined 1 lb. 7 oz. Laid end to end, they are 41 feet, 3 inches long. From my father’s mail: For every pro-Royce, there were exactly two anti-Chen pieces. For every pro-Chen piece, there were more than three anti-Royce pieces. While both sides have sent virtually the same amount of mail and both have been pretty negative, Chen’s side has sent out more negative mail and less positive mail than Royce’s side. Apparently, as registered Republicans, my mother and I were each ignored by Chen. All 15 of my mailers and all 8 of hers were from Royce. I received 6 pro-Royce and 9 anti-Chen. Mom received 2 pro-Royce and 6 anti-Chen. The anti-Chen pieces are making an impact on regular voters: one of my mother’s co-workers dislikes Chen because he seems so creepy because he’s always behind sunglasses in his pictures. None of Chen’s photos have him behind sunglasses, except the one being used on Royce’s anti-Chen pieces. In CD-39, postal workers and mailhouses are getting together to throw a big party about the post offices saved from closure and the mailhouses’ unexpected 2012 profits, but somewhere, there’s an environmentalist crying about the forests that Chen and Royce destroyed. On a final note, my father’s siding with the family Republicans: Dad’s voting for Royce. Reading Chris Nguyen’s article about last night’s Central Committee (https://ocpolitical.com/2012/09/17/live-from-oc-gop-central-committee/), I was both pleased and amazed at the deference being given to the Honorable Tom Tait, Mayor of Anaheim. 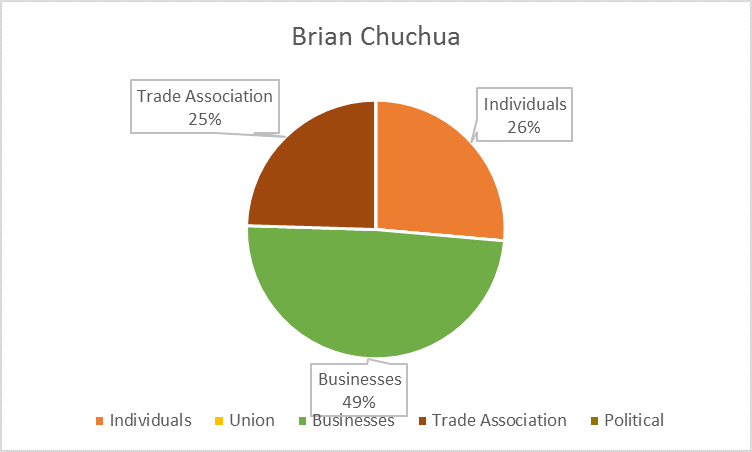 The mere suggestion that Brian Chuchua might one day get endorsed by Tait was enough to get the Central Committee to vote to endorse Chuchua with an amazing 72.5% of the vote. Reading about the discussion on the Anaheim endorsement, it was clear that Mayor Tait’s endorsement was the single most important item of discussion in Chuchua’s endorsement request. 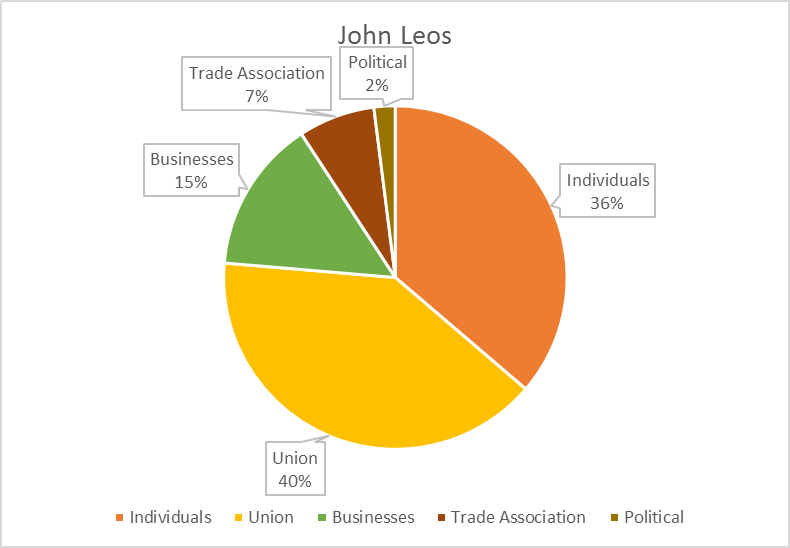 What’s also amazing is that Tait has received little blowback from the anti-union Republican Party for endorsing the union-backed John Leos for Anaheim City Council. This is a sign of the great esteem in which Tait is held that Republicans are largely refusing to criticize Tait for doing what many other Republicans have been hanged, drawn and quartered for. Why is Tait held in such high regard? It is because, more than any other person, Tom Tait is the conscience of Orange County Republicans. When the controversial TOT scheme was proposed, Harry Sidhu, Gail Eastman, and Kris Murray fell to big business pressure and Lorri Galloway fell to union pressure. While Galloway voted with him, Tait was the sole councilmember to truly stick to his principles. Tait is a true blue, limited government conservative. 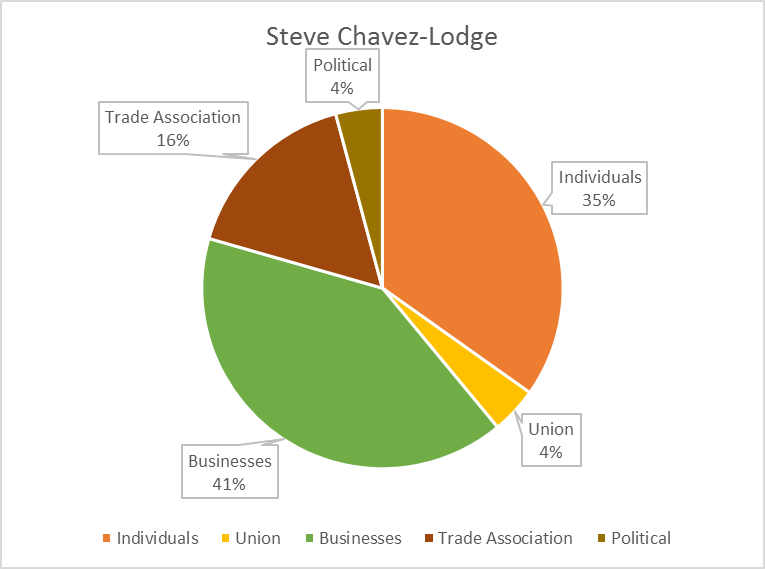 Tom Tait had originally endorsed Steve Lodge, but when he saw Lodge was more of the same big business, TOT supporter type, Tait pulled his endorsement. 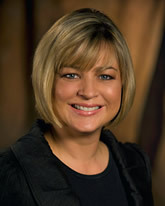 When Lodge got raked over the coals by the Endorsements Committee, he realized Tait’s principles are the Republican Party’s principles, so Lodge withdrew his request for an endorsement. That is the power of Tom Tait’s quiet conservative principles. Anaheimers chose well when they elected Tom Tait as Mayor in 2010, and they did a service for all of Orange County when they elected this noble public servant. Over the past several weeks, there has been a very public dialogue questioning how the City of Anaheim is governed and whether the current system should be changed. The media stories following the city’s special meeting on August 8 were rife with sensational headlines claiming that the Council majority had rejected or blocked an initiative that would change the city’s charter to elect council seats by districts from the current at-large system. This is patently false. In early June, the city was sued by the ACLU claiming that Anaheim is not in compliance with the California Voters Rights Act (CVRA). The city was in the process of responding to that litigation when the officer involved shootings of two suspected gang members in late July ignited the recent unrest in our streets.